I came to know about a food event known as, Muffin Monday Round Up, while surfing around for muffin creations. I decided to take part in this event, since I love baking muffins, and furthermore, it is hosted by Elena of Experiments, from Singapore. 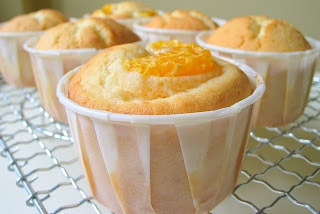 Here's my entry for the event: Mandarin Orange Muffins. I followed the recipe but replaced the blueberries with mandarin oranges since I have been wanting to bake something with them. Instead of the usual "muffin" method where the wet ingredients are added to the dry ones, this recipe is based on the creaming method, i.e. cream butter with sugar. I was rather satisfied with how the muffins turned out. The tops didn't crack that much as compared to my previous bakes. The texture is very soft and light, almost like cupcakes. The sweetness is also just right, with only a slight tang from the mandarin oranges. Sift together plain flour, corn flour and baking powder. Set aside. Mix yogurt and milk together in a bowl. Set aside. Whisk butter still soft. Add in sugar and salt and continue to whisk till mixture turns light and fluffy. Add the eggs, one at a time, and whisk until combined. Mix in the vanilla. Add in half of the flour mixture, stir with a spatula until just combined. Add in half of the yogurt & milk mixture, stir until just combined. Continue to add in half of the remaining flour mixture, followed by the remaining yogurt mixture, and finally the remaining flour mixture. Stir until just combined between each addition. Fill muffin cups to half full with the batter. Distribute orange pieces evenly among the cups. Spoon remaining batter on top. 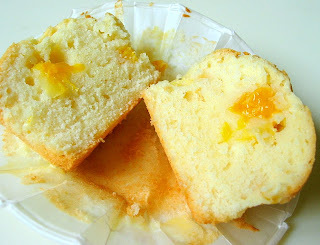 Decorate with one slice of orange on top, if desired. Bake for 25 mins until a skewer inserted into the centre comes out clean. Auspicious Muffins for Chinese New Year! These look great, but they were very popular! Thank you for your contribution to Muffin Monday! Hi Elena, Thanks for including me in Muffin Mondays! i love the look of your muffin, just like a little cake in a cup as you described it! 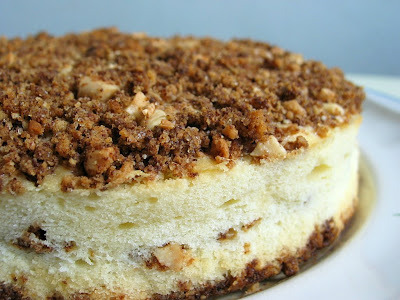 i have to try the recipe one of this day. How pretty! I'm sure they taste fabulous. Hi Eliza, Deinin, thanks for dropping by! Oh yes, your recipe seems to be a bit different. Your muffins have a finer, maybe even lighter, texture and I'm sure they were yummi. I'll bake them as well in the next days. Tried your recipe last night, but I replaced the mandarin with orange instead since no more mandarins at home. The taste is very good, but can you tell me why the bottom is a bit burnt. I used the "bottom" function, placed my tray at the middle rack @ 180 degrees (reduced to 160 degrees after 10 mins). Glad to hear that you like the muffins :)) The recipe is meant for blueberries...I believe you could add in other fruits to your liking. I am not sure why the bottom is a bit burnt? My oven doesn't have the top & bottom funtions...just one temperature control. I baked mine in paper muffin cups/liners, placed on a baking tray, in the middle rack position. Did you bake yours in the muffin pan direct or use muffin liners? As every oven works differently, guess you will have to try out a few time to get the right temperature setting. My oven has some hot spots areas...some muffins will brown faster thatn the rest...as such I need to turn the tray around when the muffins start to brown. May be you could bake yours set at a higher rack position next time? Shall try again with blueberries and banana. This time will bake them at the higher rack. Saw your curry chicken, looks good. If got time, will try to make it tomorrow, rather than always got to wait for my mom to cook. 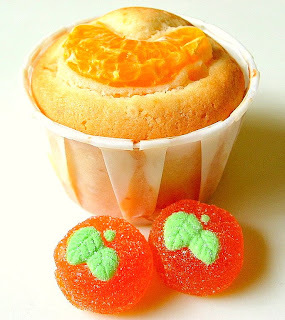 are these mandarin orange muffins made by the creaming method more cake-like in texture as compared to muffins made by the melted butter method? melthed butter method muffins seem more kueh like in the interior.